The Compare Columns Assistant add-in for Microsoft Excel makes comparing columns in Microsoft Excel worksheets very easy. It is compatible with Microsoft Excel 2007 to 2019 and Office 365. Lists do not have to be sorted! 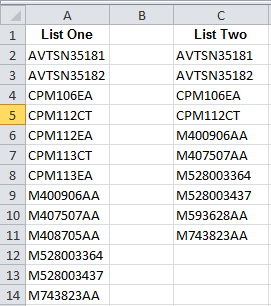 Compare data in rows you have already matched up to see what is the same or what is different. 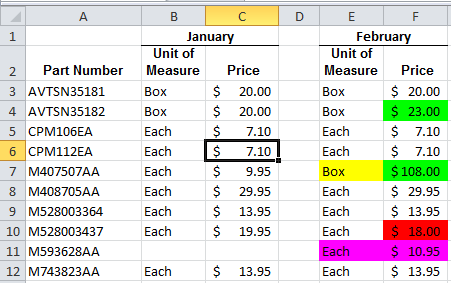 Color, copy or insert an entry in a column when a matching (or non-matching) entry is found. The following illustrates comparing data from two months to find differences. This comparison is a row by row comparison. 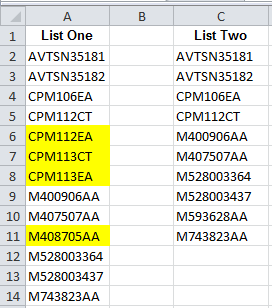 In the above, if the values go up for a part number, they are colored green. If they go do down,they are colored red. If the text is difference, like "each" versus "box", the text is colored yellow. New entreis or missing entries are colored magenta.